Dr. S. Amjad Hussain discussed With Whom Shall I Talk in the Dead of Night, a book of letters written to his deceased wife, published last year by The University of Toledo Press. He wrote the letters to his wife, Dottie, who died of cancer in 2006 after a partnership of 38 years. 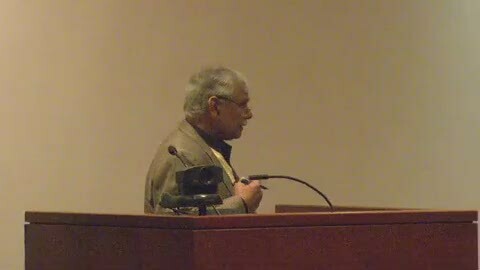 The lecture took place at the Main Library McMaster Center, 325 Michigan St.
Dr. Hussain is professor emeritus of thoracic cardiovascular surgery at the UT College of Medicine and Life Sciences, where he has been a volunteer faculty member for 33 years. Dottie was a 1964 graduate of the Maumee Valley Hospital School of Nursing who went on to a 32-year career as a staff nurse and a critical care nurse at the former Medical College of Ohio Hospital. Dr. Hussain said the idea for writing the book came to him as a way to cope with the overwhelming sense of loss he felt after his wife’s death. He wrote the letters to Dottie as if she was on an extended trip. “For two years I wrote to her from likely and unlikely places — parks, airplanes, mountain hikes and my favorite chair in my bedroom — to share with her what was happening in my life after passing and also to reaffirm my love for her. It was soothing and healing,” Dr. Hussain wrote in the introduction to the book. The book is not only an expression of one man’s grief, but also a celebration of the life he lived with his wife and since her passing.Dr. Hussain describes both the mundane and the eventful, from the evolution of the lives of his children to his own travels to his home country of Pakistan and his intellectual pursuits. Support for Knowledge Stream is provided, in part, by a generous gift from The Appold Family Charitable Trust.